Photo courtesy of Amerikansk Fotball Norge. In a country like Norway – where sports are a cornerstone of culture – it comes as no surprise that American football has gained significant traction over the past decade. Today, Norway is home to nearly 1,500 players across 30+ teams, spanning as far north as Tromsø to the southern city of Kristiansand. American football was first played on Norwegian soil following the second World War when American army soldiers stationed in Scandinavia competed against each other. Over the next few decades, the sport didn’t generate significant buzz and was only played on an annual basis by high school teams in Oslo. As time went on however, interest grew and, by the 1970’s, these annual friendly matches escalated into semi-organized tournaments. By the mid-1980’s, the first formal clubs were born as the Vålerenga Trolls led the way and the Oslo Vikings followed quickly behind. In 1987, American Football Norway (AFN) was established to bring organization to the sport and the next 20 years were extremely prosperous, particularly in the southern parts of Norway. By 1993, there were enough teams to create two separate divisions, separated by level of competition. American sports continued to gain interest throughout Norway, and in 2010 the AFN merged with various other federations to form the Norwegian Federation of American Sports (NAIF). Today, the NAIF is the governing body for all American football, cheerleading, disc sports, and lacrosse in Norway. American football is stronger than ever in Norway. New clubs are formed annually and participation has grown by an estimated 100-200 players each year. Additionally, despite geographic hurdles and sparse population, the sport has recently expanded into the northern regions of Norway. The men’s senior leagues are broken down into the following distinctions: Elite Series (the highest level of competition), Division I, and Division II (9 man). The Elite Series includes: Oslo Vikings, Åsane Seahawks, Eidsvoll 1814’s, Vålerenga Trolls, and the Lura Bulls. Division I includes: Kristiansand Gladiators, Sarpsborg Olavs Menn, Kolbotn Hunters, and the Haugesund Hurricanes. Division II includes: Vålerenga Trolls, Gjøvik Swans, Fredrikstad Kings, Oslo Vikings, Tønsberg Raiders, Lillestrøm Starfighters, and the Kongsvinger Fortress. New teams are typically placed in Division II and can work their way up to Division I via promotion. Division I teams can also be promoted to the Elite Series if their pedigree and level of play justifies this move. Currently, there are no official standards for promotion and relegation. At the seasons’ end, teams are evaluated on talent, performance, finances, and overall organizational health in order to determine the new league alignments. Since the formation of the Elite Series, Norway’s founding teams have dominated: the Vikings and Trolls have combined for 21 national championships. History, success, and proximity have fueled an intense rivalry between the two Oslo-based clubs. This comradery was illustrated at the 30-year anniversary of both clubs last season, where members of the Trolls were honored prior to the contest at the Vikings’ facility. 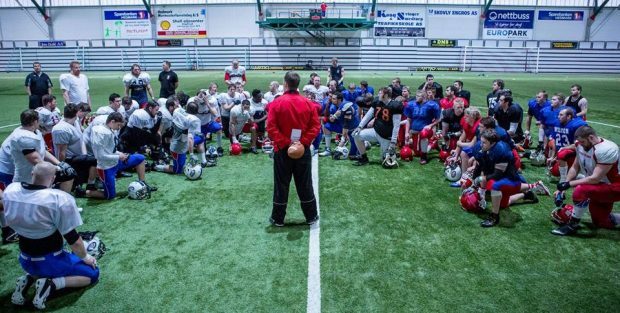 This sense of solidarity is common throughout the American football community in Norway and has played a large part in the recent development of the sport. While each team has their own secret recipe for success on and off the field, one theme is consistent across the board: investment in the youth programs is the key to taking this sport to the next level. Nearly every team in the country has shifted its focus from “win now” with their senior teams to a focus on getting younger players in the door and developing them over time. At the senior ranks, teams are given an allowance of one import player on the roster. More and more, teams are opting against import players and instead focusing these funds on top-tier foreign coaches to further develop their in-house talent. Norway is home to three youth leagues: U19, U17, and U15. The U19 league plays the standard, 11-man version of the game, while the U17 and U15 levels are played using 9-man rules. U19 Teams include: Vålerenga Trolls, Eidsvoll 1814’s, BVHIF Ironmen, Lura Bulls, Åsane Seahawks, and the Gjøvik Swans. U17 Teams include: Eidsvoll 1814’s, Oslo Vikings, Trondheim American Football Club, Drammen Warriors, Kongsvinger Fortress, Vålerenga Trolls, Tønsberg Raiders, Lura Bulls, Kristiansand Gladiators, Lillestrøm Starfighters, and the Åsane Seahawks. U15 Teams include: Vålerenga Trolls, Oslo Vikings, Eidsvoll 1814’s, Lillestrøm Starfighters, and the Åsane Seahawks. In addition to a strong men’s and youth structure, Norway also features an up-and-coming women’s league. The Women’s League includes: Fredrikstad Queens, Haugesund Hurricanes, Kristiansand Gladiators Women, Lillestrøm Starfighters, and the Vålerenga Trolls. The 90’s ushered in the first wave of women’s American football in Norway in the form of flag football. Gameplay has evolved in recent years and more and more players began advocating for a fully equipped league. In 2015, the first contact women’s series was born. Norwegian teams have had no shortage of obstacles in bringing American football to these heights over the past 30+ years. In addition to the relative sparseness of population throughout the country, properly equipped field space is at a premium in Norway. With a short window for outdoor sports, there are not only limited numbers of fields but they are typically booked solid throughout the year. This leaves the majority of teams – which are generally unable to pay for their own facilities – vying for the remaining timeslots to practice and play games. American football, while growing quickly, is still one of the smaller sports in Norway. Consequently, the sport has lacked media coverage throughout the country. This has shifted in recent years, however, and a new milestone was met this year when the Elite Series’ final match was broadcast on national television. Transportation is also a tremendous expense for teams, especially those situated in the northern part of the country. While most teams in the south are able to take buses to matches, teams from the north are often required to charter flights. This daunting cost has been a large barrier of entry for teams closer to the Arctic Circle. Yet, despite all of these obstacles, the Norwegian football community is as vibrant as ever. Teams constantly communicate with one another, sharing best practices and working to grow the sport overall. And, thanks to technological advancements, teams are optimistic about developing players faster than ever with film review and technical videos. American football in Norway truly comes down to one word: tenacity. In multiple cases with a majority of teams, there were rough patches in which particular seasons and even the well-being of the club in general was in doubt. Yet, time and time again, these teams have pulled themselves up by their bootstraps and have preserved. This dedication and heart, melded with unrelenting tenacity will serve Norway well as it continues to grow American football in Scandinavia. We look forward to more incredible feats from this Nordic country in the near future. D.J. Podgorny is the Director of Football Operations for The Growth of a Game and Premier Class Consulting and is based in Brussels, Belgium. A lifelong football enthusiast, he has experienced the game as a player in high school, a manager at the University of Illinois Division I program, a high school football coach in Monticello, Illinois and is the biggest Indianapolis Colts fan west of the Mississippi River. D.J. is also a huge fan of music and previously played bass ​in a Bay Area rock band. You can follow D.J. on Twitter at (@DJPodgorny).